Philippine Tatler Weddings asked renowned event stylist and expert, Jo Claravall, to create three table settings to suit the preferred palettes, desired moods, and budgets of couples. The elegant elements of this modern table have highly contrasting qualities but meld seamlessly into each other. The main floral composition is fluid, creating dynamism and movement, which is then juxtaposed with the imposing linear elements such as tall silver candlesticks and white tapered candles. A similar kind of contrast is shown in the use of the substantial and the delicate, combining both silver and hand-blown glass candlesticks. White French tulips and black calla lilies that have very linear characteristics are balanced by the softness of hydrangeas and the grace of Phalaenopsis. The mirrored tables, on the other hand, are complemented with plush white upholstered chairs. There exists a nonchalant placement of Cymbidum flowers while dramatic flower arrangements loom over guests without overwhelming the entire work. The chargers give an adequate pop of black in the sea of mirrors, whites and silvers. The uniqueness of this work lies in how seemingly opposing styling components tend to reinforce and bring out the beauty in each other. There is elegance to how casual- ness is broached in the styling of this reception table. Ideal for any couple who love the outdoors, the styling approach here is crisp and uncomplicated. Basking under the light of the sun, this table exudes freshness and ease. Yet when dusk falls, candles and garden-style chandeliers transition this mood beautifully. The cream linen serves as the perfect backdrop to the vibrant greens and browns, urns and claw-foot tubs. Tiny textured flowers and fruits are used in this rustic composition along with the following elements of green pears, Alchemilla, Tranchelium, Syringa, and Bouvardia. Other key styling components that exude the elevated rusticity of this table are the Chrysantemum plates, mismatched wine glasses, water goblets, patinated vessels and beautiful tapered candles holders used for Old World candlesticks. This styling approach is a unique combination of formal and fun. 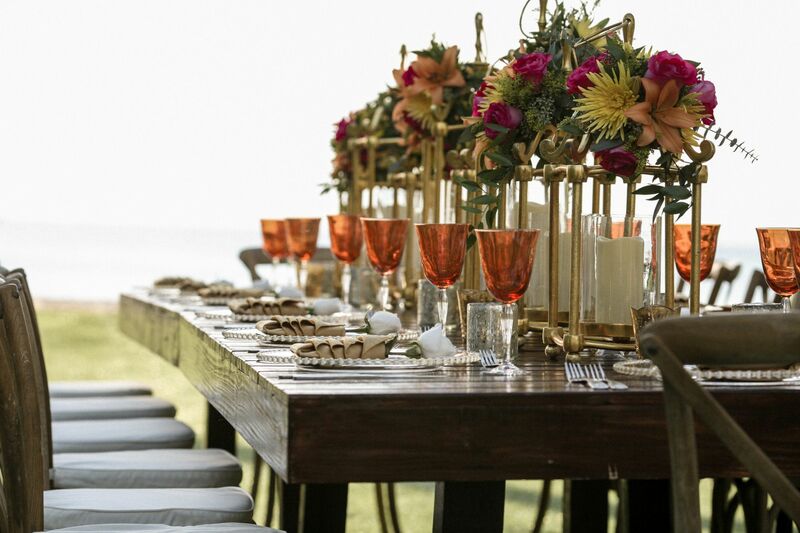 The formality comes in the use of traditional-shaped table elements like glazed artichoke bowls, enamel urns, bevelled crystal wine glasses and rose gold candelabras. This, in turn, is balanced by the casual modernity of the marble vases used as oral containers, the spirited peacock plates, rose gold water goblets, gold atware, white stemware, and whimsical infinity chairs. The highlight of this table is the touch of whimsy to balance out the classical elements while still remaining coherent to its vision. Flowers are highly varied but are deliberately kept in the same colour family for cohesion: Peonies, Astilbe, Garden Roses and Hydrangeas. The composition of these oral arrangements and other table components are kept tight and asymmetric, exuding the air of a young, stylish couple. Ultimately, it is a study on bold eclecticism tempered by refined elegance. Watches & Jewellery What Do You Make Time For?